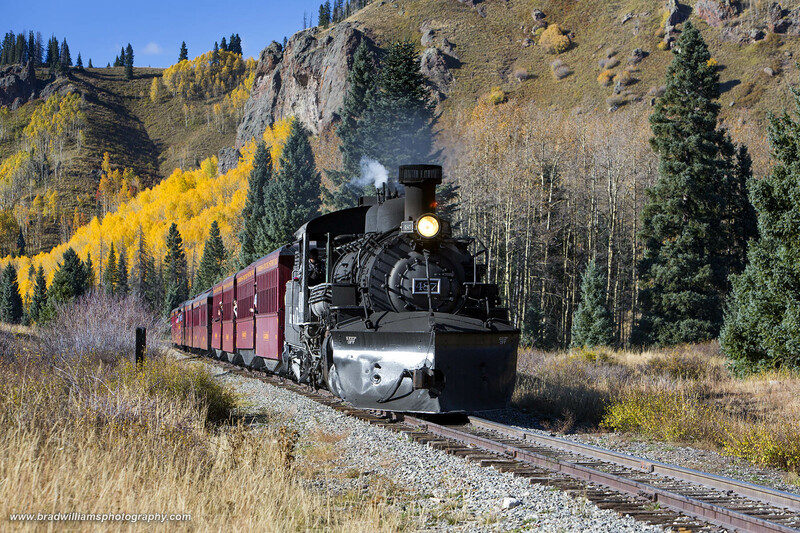 Cumbres & Toltec Scenic Railroad Locomotive 487 leading a train near the Colorado/New Mexico Border on its return trip to Chima, New Mexico on a beautiful fall afternoon. Photo © copyright by Brad Williams. A high quality traditional photo print. Light sensitive cromogenic papers are exposed in a digital enlarger like a LightJet or Chromira then processed in RA4 chemistry. Photo will most likely be printed on Kodak's Professional Endura paper or may be on Fuji's Chrystal Archive paper. Archival Inks on a Satin Epson photo paper. Please allow 7-10 business days for delivery. High Gloss Infused Metal Print. The AlumaPress product features a dye-sublimation ink transfer to aluminum. A white base infused print illustrates a traditional print appearance adding a depth and richness of color. This is a remarkably modern presentation playing up the unique, boldness of metal with a super gloss finish. A protective, acid-free black coating is applied to the back of the infused metal and is completed with a black 1/2” recessed backing with concealed French cleat hanger to give it a floating effect when mounted on the wall and is ready to hang. Recycled, eco-friendly wood, coated a black with acid-free moisture resistant barrier. The piece is finished with 3/16 of an inch black beveled edge, and ready to hang on the wall. Using exclusive high grade acrylic, PlexiPlaqs are a resoundingly unique way to present the photographs with superior clarity and durability. DuraPlaq® believes in providing the best products to customers and uses only the highest quality, premium museum-grade acrylic on the market. Partnering superior ultra violet light protection and a scratch resistance coating, this acrylic product has superior durability and protection. A DuraPlaq® fine art print is face mounted in a fully acid-free manner. The front face is finished with a beveled edge to prevent crazing or cracking along the edges with regular cleaning. A protective, acid-free black coating is applied to the back of the acrylic face-mounted print and completed with a black 0.5” recessed backing with concealed French cleat hanger to give it a floating effect when mounted on the wall. This product comes ready to hang. Printed on Canvas and stretched. Canvas prints are ready to hang without any framing required. E Mounts are a luster print mounted onto a lightweight and durable sheet of E-Panel (two piece’s of aluminum sandwiched over an extruded PVC core). They are then protected with a pearl laminate. E-Mount come ready to hang. Please allow 7-10 business days for delivery..